Helps with weight loss. Brushing your teeth regularly after meals tells your body that you are done eating, and you are also less likely to snack with the knowledge that your minty breath will spoil the flavour of your treats. Boosts your overall health. Brushing your teeth has been proven to reduce your risk of many diseases, by fighting the causes of gum disease. Saves you money. Taking good care of your mouth from an early age can help reduce the need for unnecessary dental visits, expensive procedures, braces and some oral diseases. Spending those few dollars on a good toothbrush, paste and dental floss can go a long way in keeping your wallet healthy too! Minimise your risk of diabetes and other diseases. Gum diseases make it very difficult to control your blood glucose level, and can also contribute to the progression of diabetes. We all know that soft drinks and lollies are bad for your teeth, due to their high sugar content and tendency to linger in the mouth. Your diet is one of the most important factors in keeping your teeth and gums healthy, so you need to watch what you eat. Not only will eating a balanced diet from these food groups keep your body healthy, but a balanced diet is the best way to avoid chemical imbalances in the body which cause tooth decay. For example, eating too much acidic foods (like cranberries or blueberries) can actually be bad for your teeth, because the acidic nature of the foods erode tooth enamel and cause decay. If you’re serious about your oral health, you should always avoid diets that cut out any of the food groups, due to the reasons above. You should also drink plenty of water, as saliva protects oral tissues. If there is no ready source of water near you, you can alternatively chew some sugar-free gum, as this will stimulate saliva production in the mouth. Other drinks that are good for your teeth include milk and unsweetened tea. So basically stay away from the sugary food and drinks, try to eat a balanced diet and you should be fine! It’s pretty common knowledge that you need to brush your teeth before bed. After a difficult day of eating and drinking, we are all tempted to jump into bed and fall asleep. But wait! What about those nasty food particles stuck in between your teeth? 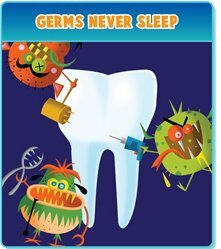 These evil little bacteria cause both cavities and tooth/gum decay, and must be vanquished before they spread and continue to cause harm as you sleep. If you’ve already brushed and start eating again, that vigorous brushing session was wasted! As soon as your teeth come into contact with more food/beverages the bacteria begins to multiply again, and you must return to the bathroom and brush your teeth before you sleep. From the headline I think you can gather what this post is about. If you’re planning on having a big night of drinking, you need to make sure that you take all the steps to protecting your teeth from the decay caused by the sugars in spirits, beers and soft drink mixers. As you’re out and about, it’s good practice to constantly drink water. Apart from the obvious hydration aspect, this also helps cleanse your mouth of any harmful sugars found in alcohol. Chewing gum throughout the night (and especially after on the way home) is a good way to stimulate saliva flow and stop sugars and acids from sitting on your teeth. Of course, the most important aspect is brushing and flossing your teeth before you collapse on your bed. Getting rid of any last traces of alcohol and sugars in your mouth makes sure that they will not sit and rot your teeth overnight, as well as strengthen your enamel (and keep that breath smellin’ fine). A proper brushing session should last for at least two minutes, but not everybody follows the simple guideline of ‘two minutes, twice a day’. For many years it has been a mystery in the scientific community as to the time-bending properties of the toothbrush. It would seem that time travels at half it’s usual speed during brushing (mostly because it is SUPER boring). Here’s an example to get you started. Have a go brushing your teeth during this two minute video, and see if the time goes any faster! Follow along on our social media pages, and we’ll post more two minute entertainment! Welcome to our website! We thought the first post here should be about who we are, and what we hope to achieve through our campaign. A surprising proportion of young Australians experience oral health issues, due to a number of factors ranging from poor diet to bad dental care habits. We hope to both educate and encourage young people to properly look after their teeth, and shape positive dental habits for later life. This campaign is run by Leo Hennessy and Ryan Shanahan, two 20 year-old media students from Sydney, Australia. We hope you enjoy the information and posts to come, and if you have any thoughts, questions, or just want to say hi, we would love to hear from you!